MainAll NewsInside IsraelKahlon, Bennett, Be Courageous! Zionist Union Chairman encourages ministers to leave coalition and the PM. 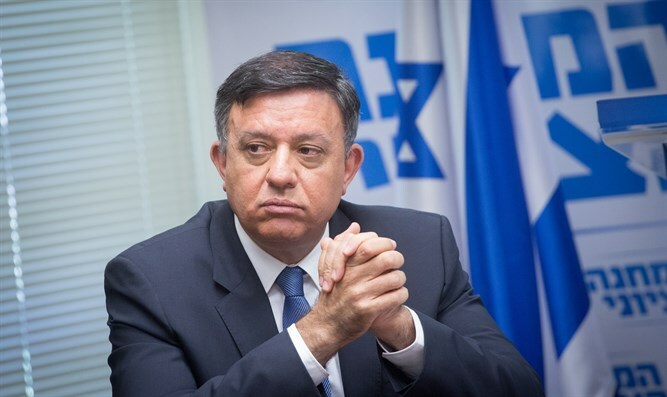 On Monday afternoon, Zionist Union Chairman Avi Gabbay, opened the faction meeting with a call to Netanyahu's partners to dismantle the coalition as soon as possible. "This coalition is a bunch of sevivonim, (spinning top played with on Chanuka) that Netanyahu is spinning to survive. But in the end, every sevivon (singular) will fall, and this coalition too, is at a moment before the fall," Gabbay said. "I call on the heads of the coalition, instead of dealing with small things -accept the real decision ad dismantle Netanyahu's government. At your initiative, not when he decides for you," Gabbay added. "This is a people who get up in the morning, take the children to school and go to work. They have parents who who built the country and expect to be treated such as. These good citizens want this body to be concerned about them and their lives. "I will surprise you and say a good word about Liberman. He had the courage to leave the chair," Gabbay added. Turning to Kahlon and Bennett he said, "I call on you, Moshe, Naftali - be courageous, stand up to the prime minister, go with the public and dismantle this government. There are citizens who want their elected representatives to concern with their lives. "